Voluntary unemployment is defined as a situation where the unemployed choose not to accept a job at the going wage rate. Generous unemployment benefits, which make accepting a job less attractive. High marginal tax rates, which reduce effective take home pay. Unemployed hoping to find a job more suited to skills/qualifications. Some jobs are seen as ‘demeaning’ or too tedious. For example, fruit picking/security guard. Preferenc.e for ‘leisure’ (not working) over working. Benjamin and Kochin (1979) argued that the new means tested National Insurance scheme of 1920 led to voluntary unemployment in the 1920s and 1930s. They stated high rates of unemployment. They argue insurance scheme raised the unemployment rate by five to eight percentage points on average. However, Rodney Cross (1982) disputes this. In “How Much Voluntary Unemployment in Interwar Britain?” He points out nearly 3 million claims for unemployment benefits were refused in this period. 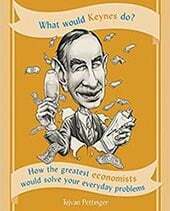 Keynes argued the unemployment of the 1920s was due to deflation, insufficient demand and structural change. In particular, the decision to re-enter the Gold Standard in 1926 led to an overvalued Pound, a decline in exports and depressed demand. Selective employment. Despite high rates of unemployment, employers can report difficulty in filling labour vacancies in certain sectors. Some jobs like teaching and doctors are due to lack of skills. But, some jobs are hard to fill because they are deemed to be ‘unsuitable or demeaning’. For example, jobs such as fruit picking have low take up rates by native UK workers. Farmers are concerned that a fall in migrant labour will make it hard to find workers to pick the fruit. Voluntary unemployment is more likely when vacant jobs invoke negative social connotations. How selective are workers in choosing to reject work? In other words, those with qualifications have the highest expectations of the job market and so are more likely to reject “low-paid, dead end jobs”. Frictional unemployment. Voluntary unemployment has a close relationship with frictional unemployment. Frictional unemployment is the type of unemployment where people are in between jobs – taking the time to find a suitable job. 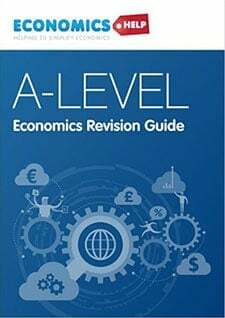 For example, if an unemployed graduate rejects a job as a shelf-stacker in his first week of unemployment – this is ‘voluntary unemployment’ However, we could easily just call it frictional unemployment as it may take a few months to find a job which requires a degree. Structural unemployment. If airplanes become fully automated, skilled pilots would lose their jobs. The unemployed pilots may struggle to find jobs in new industries. They may get offered menial work (e.g. baggage handler) however for a skilled pilot used to job with a certain prestige, they may turn down this ‘menial work’ hoping to get a job with some degree of skill and prestige. We could then term this situation of unemployed pilots as either ‘structural unemployment’ or ‘voluntary unemployment. Demand deficient unemployment. 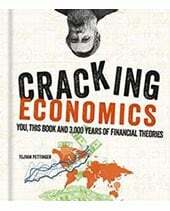 Demand deficient unemployment occurs when a fall in economic growth leads to less demand for labour. This has no link to voluntary unemployment as the unemployment is due to insufficient demand in the economy and insufficient job vacancies. 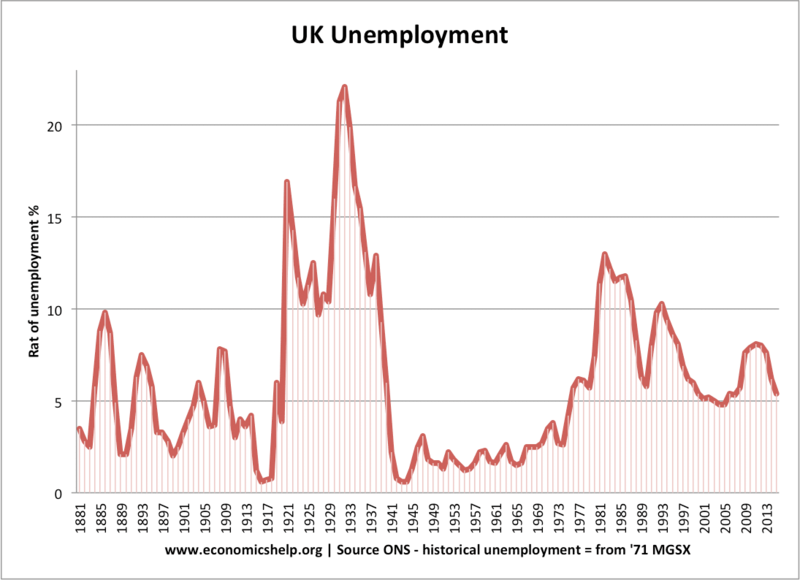 However, in times of high unemployment, people may still label it ‘voluntary unemployment.’ In 1931 the UK cut unemployment benefits due to concerns over the budget deficit and the possibility of ‘voluntary unemployment’ But, cutting benefits did nothing to reduce unemployment. It contributed to a further fall in aggregate demand and unemployment continued to rise. However, in times of high unemployment, people may still label it ‘voluntary unemployment.’ In 1931 the UK cut unemployment benefits due to concerns over the budget deficit and the possibility of ‘voluntary unemployment’ But, cutting benefits did nothing to reduce unemployment. It contributed to a further fall in aggregate demand and unemployment continued to rise. 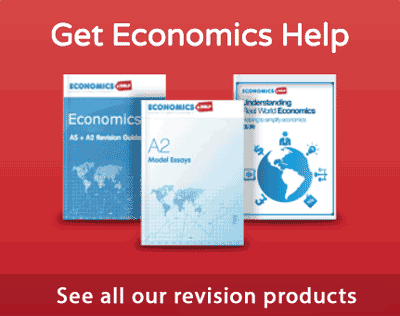 Is Voluntary unemployment a suitable term? ‘Voluntary unemployment’ is politically sensitive because it can suggest the unemployed are ‘lazy/work-shy’ It can be used as a justification for cutting unemployment benefits – which may cause poverty. Those on the right are more likely to view unemployment as having a ‘voluntary’ component. Those on the left are more likely to underplay ‘voluntary’ unemployment and point to structural and social factors. 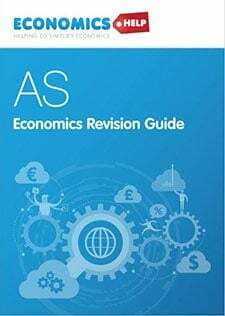 Another issue is that some argue voluntary unemployment means the unemployed are economically inactive. i.e. by choosing to reject work they have left the labour market. This means they would reject every possible job. In practice most voluntary unemployment is selective to particular types of jobs. If the skilled unemployed take the first job offered, it can lead to an inefficient match of skills in the labour force. Sometimes waiting to find a more suitable job can enable a more efficient use of past training and education. However, if voluntary unemployment lasts for a long time, this also is a type of economic inefficiency with necessary jobs remaining unfulfilled. 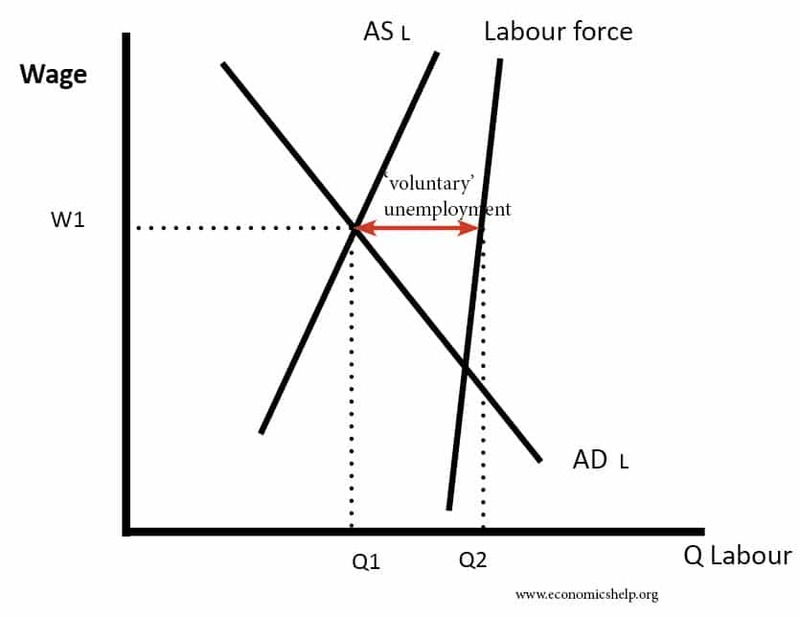 One way of showing voluntary unemployment is the difference between the Labour Force (those of working age, looking for work) and the Aggregate Supply of Labour AS L (those supplying their labour). The aggregate supply of labour shows the number of people willing and able to supply their labour in the labour market. If people turn down jobs on offer, then this is considered to be ‘voluntary unemployment’. (However, if workers are unable to supply their labour for jobs because they lack the relevant skills (i.e. structural unemployment), then it is misleading to term this voluntary unemployment. If they applied for the job, they would not be accepted because they don’t have the right skills – even though they would be happy to work at that wage rate. Poverty and insecurity in Britain Shildrick, Tracy et al. Great article. Enjoy reading your blogposts.